The new series of hit period drama Downton Abbey will be shown in Scotland in the autumn, STV has announced. STV, which operates the channel 3 franchise across most of Scotland, did not transmit the first series last year due to a dispute with ITV. It has now said that the series, which drew massive audiences in England, will be shown on Sunday nights when it returns to the network in September. The first series will be broadcast on STV on Sunday afternoons in August. Downton Abbey, which starred Dame Maggie Smith and Hugh Bonneville, followed the lives of the aristocratic Crawley family and their servants in the run-up to World War One. The show was a huge hit for ITV, recording up to 11.8 million viewers. There were reports that tens of thousands of Scottish households watched the first series on satellite TV via ITV London. The complex dispute between STV and ITV started in 2009 with STV saying it wanted to take more control of its output and increase the number of programmes made by the company. ITVplc - which owns the ITV1 stations in England, Wales and the former Border TV region - believed STV was still contractually bound to pay its share of the network programme budget and owed it money. The dispute with ITV was settled in April after the Scottish company agreed to pay ITV £18m. Scottish actress Phyllis Logan, who plays the Downton Abbey housekeeper Mrs Hughes, said: "I'm delighted that STV is showing Downton Abbey in Scotland - it means my family and friends in Scotland will be able to watch it at the same time as the rest of the UK. "This might push our viewing figures up even higher which can only be good." Iain Glen, the Scottish actor who joins the cast for the second series as new character, Sir Richard Carlisle, added: "I am not party to the original decision as to why STV didn't acquire the original series from ITV, but I am delighted the decision has been reversed and the people of Scotland will be able to see what all the fuss has been about." Bobby Hain, MD of channels at STV, said: "We're delighted to bring viewers the first airing of series one of Downton Abbey in Scotland and the much anticipated second series as part of our autumn schedule. "Downton Abbey has proven to be a hugely popular drama and we very much hope our viewers enjoy it." 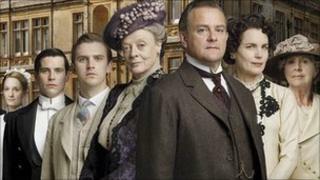 Series one of Downton Abbey starts on Sunday 7 August and series two will follow on Sundays beginning on 18 September.